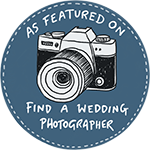 Are you looking for a photographer for a shorter wedding day? Perhaps your are planning an elopement or just an intimate ceremony for you both but would love some beautiful photographs to treasure from your special day. We have two packages for shorter photography coverage by just Helen as your photographer – these include coverage of your ceremony and portraits of the both of you afterwards and onwards until your reception if required. £395 for up to four hours coverage – includes gallery of images on USB to keep. Contact us for more details and to see if we have your date available.